The Author Dr. M. Arokiaswami was born on June 25, 1911, in Somanur, a small village in the District of Combatore. He entered the school as an average boy and emerged as an outstanding student from St. Joseph’s College, Trichy. He choose the noble profession of teaching and began his career in the Pachaiyappa’s College, Chennai. He worked to rise the coveted position of the Head of the Department of Indian History, Madras University, just two years earlier to his death. (18-11-1968). His literary works are best known in the fields of History and Tamil. The University of Madras is one of the three premier Universities of Pre-Independence India and the mother of all the Universities of South India. Its Publications Division has been functioning functioning fruitfully for a period of more than a century, adding glory to this prestigious University. About 600 titles of various types of books, scholarly research works, dictionaries, endowment lectures, journals, etc., in about eight languages have been published so far. Its activity is not confined to bringing out new works. One of its prominent functions is to reprint valuable old works that went out of print despite having a good demand. 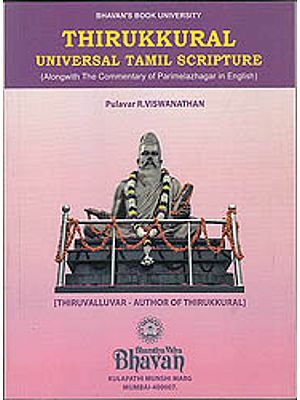 The English-Tamil Dictionary edited by Dr. A. Chidambaranathan Chettiar is one such work. The Dictionary went out of print a few years ago. There was much demand for it. After my assuming the office of the Vice-Chancellor, I took efforts to reprint it considering its value and the reprinted copies are now available for sale in a handsome volume. At present five works have been reprinted in this series. They are: Machenzie Manuscript (Volume-1), The Classical Age of the Tamils, Excavations at Uraiyur, Early South India Paleography and Thirukkural: A Commentary by Ellis. Of these, the first work is a document cataloguing the manuscripts on Tamiology. The next three titles depict Ancient Tamil Nadu in its historical perspective. Ellis’ work is a pioneering attempt shedding light on the greatness of Thirukkural which is of significance for both foreign scholars and the general public. I hope the scholarly world and the general public will whole heartedly welcome our efforts in reprinting such valuable old books and putting them once again on the book stands. In this context, I congratulate and thank the Publication Committee, staff of the Publications Division, its Director, Dr. Oppila Mathivanan and the Printers for bringing out these work in an aesthetic format. This small work is on a great subject fundamental to a knowledge of early South Indian history. It deals with the well- known Sangam age, its poetry and poets, its economic and political conditions and above all with its society and culture. The term" classical age" fits in aptly not only because it deals with poets of great literary excellence but also because it was a period of Greek and Roman connections with South India, of a period when Roman soldiers and merchants filled the great cities of the Tamils. It is a little more than fifty years since the literary treasure of the ancient Tamils have been discovered and much good use has been made of them by scholars both literary and historical. Yet many fundamental points have been left undecided. I have taken up these questions and arrived at conclusions which, it is hoped, would appeal to scholars. Far too long have they been hanging in fire, and the sooner we come to some settlement on them the better it would be for the history of South India. I am glad that I have been able to undertake this study in keeping with the traditions of the Department of Indian history of this University from whence have gone out into the world many such small studies on great subjects like Stone age in South India, South India in the age of the Mantras and Origin and spread of the Tamils. My thanks are due to the authorities of the University for getting this work published. I sincerely thank my student Mr. A. Kesavan M.A., M. Litt, who is at persent working as lecturer in history in Pachaiyappas College, "Kanchipuram for seeing through the proofs and preparing the index. My thanks are also due to Mr. A. Sampath and the Super Power Press for executing this work neatly. The period of the Sangams is now recognized by historians and Indologists to be the classical age of the Tamils analogous to the age of the classics in Greece and Rome and to that of the later Renaissance in Europe. It is now but half a century since the precious literary finds of this period have been discovered from various places in South India, where they had been kept by individual families literally laid under the dust of time and oblivion and even within this short space of time they have gained such fame and popularity that in some ways their evidence constitutes the best known age of South Indian History. Great credit is due to those indefatigable savants of whom special mention must be made of Dr. U. V. Swaminatha Iyer, who rescued most of the manuscripts from oblivion and possible destruction. This classical age of the Tamils is, not only by the consensus of learned opinion but also as proved by indisputable evidence, assigned to the first few centuries before and after the commencement of the Christian era. The literature produced by the Tamils of that age is known as the Sangam literature and that literature itself proves the high antiquity of Tamil culture. The Tamils who produced a literature, which reflects a fairly advanced material culture, should have inherited it over a period of not less than a millennium. So it will not be wrong to deduce that Tamil culture in the Tamil country did take root earlier than 1000 B.C. There are even indications, though dim and inferential, that the culture which they transmitted to posterity was not of a mere localised nature. It was pervasive and prevailed over a much wider area than even the land, that we now call India. Most scholars are now tending to the view that the' Dravidians had proto-historic connections with peoples of the eastern Mediterranean region. The well known affinity between the Sumerians and the Harappans of the' Indus valley as also Fr. Heras' gallant attempts to connect the authors of the Indus valley culture with the proto-Dravidians are pointers at least to the wide-spread nature of that culture. The argument that the Dravidians were the most ancient natives of India and had peopled South India from the very beginning is, however, difficult to sustain. There are many racial strains in South India" and descendants of groups perceptibly more primitive and indicative of fl much earlier, stage in civilization than that of the Dravidians. The possible connection between the Indus valley culture and the Dravidians and' the proved contacts between them and the eastern Mediterranean culture are themselves additional supports to the view that the Dravidians were only the second layer of the population in India. Most of the arguments to support the thesis that the Indus culture was Dravidian have been presented with considerable scholarship by, Fr. Heras in his valuable work on' the Indus valley civilization. He bases his views 011 an analysis of evidence, adduced from three points of view: 1) That the Indus' valley, script so, far undeciphered can be made to yield-some meaning if the ideas expressed in the .symbols 'are taken to stand .for proto-Dravidian idea-symbols, like . 'an’ 'ur', 'vel' etc. 2) The evidence of religion in the Indus-valley 'helps .us- to equate the linga found there' with the proto-Dravidian Siva and also connects, 'Pasupatesvara " with the later worship of that God. 3) The highly material civilization of the Indus valley bereft of any marked 'religious or spiritual tinge is reminiscent not only of ancient Sumerian culture but also of later Dravidian culture. Still it is by no mean, possible, to categorically assert that the Indus valley Culture was' Dravidian 'or that its language was proto-Tamil though it cannot 'be, however, gainsaid that some probing along those lines will yield useful data for further understanding of proto-Dravidian problems. Ancient contacts of the early Dravidians with the Sumerians and other peoples, of the Middle East are mentioned extensively in many classical texts'. The ancient capital of Sumer was called 'U r " which bears identity with the Tamil word' ‘ur' meaning 'town'; further, archaelogists have discovered at this spot buildings in which South Indian teak was used as early as 4000 B.G. Scholl, referring to comparatively later times, mentions that south India traded in muslin and scents with distant countries like Egypt and Africa through Arabia and the Port of Aden, where Arabian traders acted as intermediaries. But the classical' age of the Tamils as studied here was one during which a fairly advanced material civilization had taken root among the Tamils and they specialised in foreign trade especially with the countries of the 'Middle East', particularly Egypt and Mesopotamia and with the Mediterranean countries of Italy arid Greece. The Roman Contacts with Tamilaham were extensive in the commercial field but limited in the cultural field, at least so far as we know. The Tamil literature Of the period is full of references to the Roman contacts with South India and the plethora of Roman coins of this period' dug up in various places in South India bears evidence to this condition. Mr. R. Sewell, who has made a careful study of these coin-finds in South India, has no difficulty in establishing that the commercial contacts between Rome and South India commenced' during the reign' of Emperor Augustus (c. 60 A.D.) and continued right down to the death of Caracalla in 217 A.D. We 'have also evidence of the two Indian (Pandyam) embassies sent to Augustus Caesar, one of which he is said to have received, according to Roman records, at Terragoda (in Spain) and the other on the island of Cyprus. Apart from the mutual influencing caused by such trade and political contacts, the predominently commercial and secular nature of the civilization which developed in the two countries tended to grow certain social institutions of a similar nature in those areas. But it would be risky to draw more than a passing and general conculsion from this similarity. In this context it may not be inappropriate to give in brief outline the picture of South Indian society afforded to us by the contemporary Tamil Literature. The Tolkappiam mentions Murugan, Mayon, Indra, and Varuna as the gods presiding over the four forms of territorial regions of Tamilaham. Indra is referred to as 'Vendan' (the king of the Devas, obviously) in that text. It is significant that Varuna, also a Vedic god, finds mention in Tamil literature; and that Mayon (whose attributes are mostly equal to those of Vishnu) and Murugan (whose equation with Subrahmanya or Karthikeya is usually accepted) are rarely, if ever, mentioned by their Sanskrit names. They worshipped the crescent moon whose association with Siva endowed it with unusual importance as an object of worship. Respect for omens and belief in superstitions were quite common. Bad dreams, the falling of comets, indication in the direction of bird flights are mentioned as evil forebodings in Sangam works like Purananaru. Animal and even human sacrifices to propitiate the gods are often referred to in these poems and numerous festivals in honour of Indra, Kannan etc. find mention in Sangam works. The fine arts generally and music and dancing (including primitive Drama) particularly occupy a large place in Sangam poetry, though we do not get enough technical details to reconstruct or understand fully those arts as they were practised in those distant days. 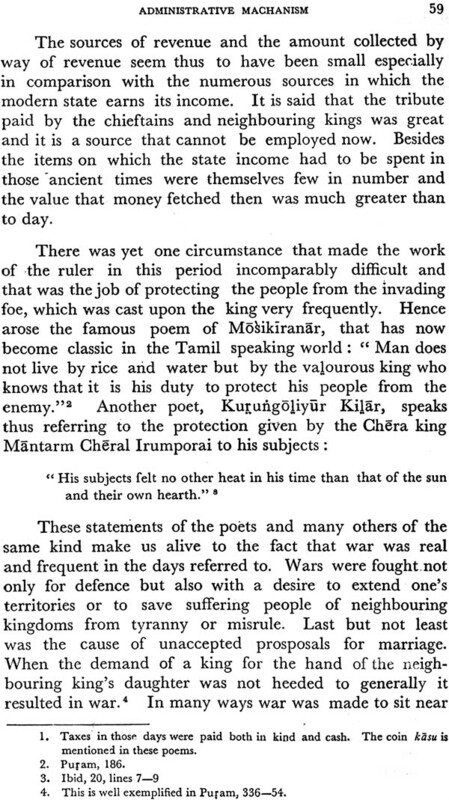 Apart from accredited poets, who attached themselves permanently to particular patrons and the establishment of a Safigam or a Board of literary censors at Madurai, there was a large body of wandering minstrels, whose life was far from settled or happy and who eked out a living which rested all the time on the moods of patrons. They were called the Panar and they were a nomadic group of people. The Tamil polity of those days was monarchical; but society had not departed from its tribal mooring and it was a society governed by kings and chieftains who warred quite often among themselves. But society itself was a fairly peaceful society well versed in the art of manufacture and indulging in extensive trade with enough leisure and inclination to practise fine arts like poetry and music. The religious attachment of those people were not marred by bigotry but qualified by an uninihibited tolerance. They were lovers of comfort and the mass of the people were anything but pessimist. Lack of profound metaphysical texts like the Upanishads in their literary repertoire is made up to some extent by the existence of odes and lyrics, which are exceedingly charming in their naturalness of description and context. The civilization of the Tamils of the Sangam age had reached a stage which prevented its being completely dominated or effaced by any foreign culture, including that of the Aryans. The utmost that could be achieved, and in fact was achieved, was a fusion between the two cultures, native and foreign.